Meningitis - catch, body, viral, contagious, causes, What Is Meningitis? In Greek, the word for membrane is "menix." This is the source of the word "meningitis," which means an inflammation of the membranes (the thin covering layers) that surround the brain and the spinal cord. 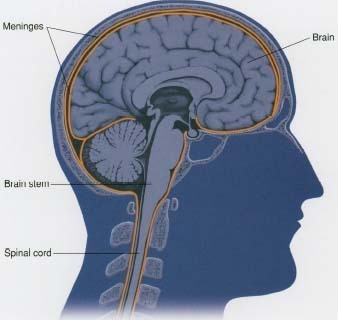 These membranes are known as the meninges, and inflammation (swelling) is the body's reaction to infection or injury. The most common form of the disease is viral meningitis. In 9 out of 10 cases, the cause of viral meningitis is one of a large group of viruses known as enteroviruses. These viruses infect the digestive tract, but they easily spread to other parts of the body. The second most common form of the disease is bacterial meningitis, which is caused by bacteria. Before the 1990s, Haemophilus influenzae type b (Hib) was the leading cause of bacterial meningitis. However, new vaccines for children have reduced this problem. Today, Strepto-coccus pneumoniae and Neisseria meningitidis are the chief causes. Meningitis also can be caused by fungi such as Cryptococcus neofor-mans, or things other than infection, such as a drug reaction or cancer involving the meninges. It is important to know the cause of meningitis, because this determines how severe the disease may be and its treatment. Viral meningitis usually is less severe than bacterial meningitis. Most people recover in 7 to 10 days. In contrast, bacterial meningitis can be very serious. If not treated promptly, it can lead to permanent hearing loss, brain damage, learning disorders, or even death. How Do People Catch Meningitis? Some, but not all, types of viral and bacterial meningitis are contagious. People infected by a virus that causes meningitis may not always develop the disease, but they can pass on the virus to others, who may get menin-gitis. Fewer than 1 in 1,000 people infected with viruses that cause meningitis actually get meningitis. Most infected people do not get sick, or they become only mildly ill with a cold, rash, or low-grade fever. Enteroviruses, the most common cause of viral meningitis, are very common in the summer and early fall, and many people catch them. Enteroviruses usually are spread through contact with saliva or mucus. This typically happens when people are exposed to the virus on the hands of, or on objects touched by, people with enteroviruses, then rub their own eyes, nose, or mouth. The virus also is found in the stool (bowel movement) of people who are infected with enteroviruses. It is spread this way mainly by young children who are not toilet trained, or by adults who change the diapers of infected babies. Good hand washing (thoroughly and often) is important to prevent the spread of the viruses that cause meningitis. Some forms of bacterial meningitis are contagious. The bacteria are spread through coughing, kissing, and other breath and throat secretions. They are not spread by casual contact. However, people who are in close contact with an infected person may catch the infection. This includes those who live in the same house as the infected person or children who go to the same daycare center as infected children. It also may include girlfriends or boyfriends who kiss infected people. Outbreaks may occur in places like dormitories, military barracks, and prisons. Anatomy of the brain. In meningitis, the meninges that line the brain become swollen and inflamed. Most cases of both viral and bacterial meningitis occur in babies and children under the age of five. Most cases of meningitis caused by a fungus occur in people with an immune system * that has been weakened by other diseases (such as AIDS) or by taking certain medications. In babies, the classic symptoms of fever, headache, and a stiff neck may not be present, or they may be hard for other people to notice. Possible symptoms in babies include fever (sometimes), crankiness, lack of activity, vomiting, refusing to eat, and being hard to wake up. As meningitis gets worse, people of any age may have seizures. In severe cases, the disease can lead to coma or even death. The symptoms of both viral and bacterial meningitis may develop over a period of several hours or several days. With bacterial meningitis, adults may get very sick within 24 hours and children even sooner. In contrast, meningitis caused by a fungus, cancer, or other noninfectious disease may take weeks to develop. A few types of bacteria and viruses also lead to slow-developing meningitis. These include the bacteria that cause tuberculosis, Lyme disease, and syphilis, and the virus that causes AIDS. The symptoms of viral and bacterial meningitis often are the same. Therefore, it is important to see a doctor right away if these symptoms appear, because early diagnosis and treatment are critical for bacterial meningitis. A diagnosis usually is made by testing a sample of the fluid that surrounds the spinal cord. This sample is obtained by a spinal tap, a procedure in which a thin hollow needle is inserted into an area of the spine at the lower back and a small amount of fluid is withdrawn. This fluid is tested in a laboratory for signs of meningitis and to identify which type of bacteria, if any, is causing the disease, because this affects the kind of antibiotics that will be used to treat it. The treatment for meningitis depends on the cause. People with most types of viral meningitis usually get better on their own. To help them feel better, doctors may advise them to rest and to take non-prescription medication to relieve headache and fever. People with bacterial meningitis can be treated with a number of effective antibiotics, depending on the type of bacteria involved. People with meningitis caused by a fungus can be treated with antifungal medication. For the best results, treatment should be started as early as possible. It is difficult to avoid the enteroviruses that cause most cases of viral meningitis. However, it helps to wash the hands thoroughly and often. People who are close to others who have bacterial meningitis caused by N. meningitidis may receive antibiotics to prevent spread of the disease. There are vaccines against several bacteria that cause bacterial meningitis, including Haemophilis influenzae type b (Hib), some strains of Neisseria meningitidis, and many types of Streptococcus pneumoniae. There are about 500,000 cases of meningococcal meningitis (N. meningitidis) worldwide each year. There are about 50,000 deaths worldwide each year. I The largest outbreaks occur in Africa south of the Sahara desert during the dry season. The World Health Organization recommends that travelers to countries affected by meningitis outbreaks get the N. meningitidis vaccine. The vaccines against Hib are safe and very effective. It is now standard for all children in the United States to receive Hib vaccine. The vaccine against N. meningitidis is not routinely given as part of childhood immunizations. However, it is sometimes used to control small out-breaks of meningitis in the United States in schools, prisons, and other closed settings. Large outbreaks of the disease occur in some countries, and travelers to these areas may need to get the N. meningitidis vaccine as well. The vaccine against many types of S. pneumoniae helps prevent not only meningitis but also pneumonia caused by these bacteria. The vaccine is recommended for everyone over the age of 65 and for younger people with certain ongoing medical problems. U.S. Centers for Disease Control and Prevention (CDC), 1600 Clifton Road N.E., Atlanta, GA 30333. CDC posts fact sheets about bacterial meningitis and about viral (aseptic) meningitis at its website. World Health Organization (WHO), Avenue Appia 20, 1211 Geneva 27, Switzerland. WHO posts fact sheets about meningitis and other communicable/infectious diseases worldwide at its website.